One of the new features in Android 6.0 Marshmallow is the ability to treat microSD cards as if they were internal storage. If you have a cheap phone with 8GB of storage or less, this can let you easily double or quadruple your available storage space for just a few bucks. But if you’ve got a more expensive phone with a decent amount of built-in storage space, you might want to think twice before formatting a microSD card for use as internal storage, because there are some potentially unpleasant side effects. 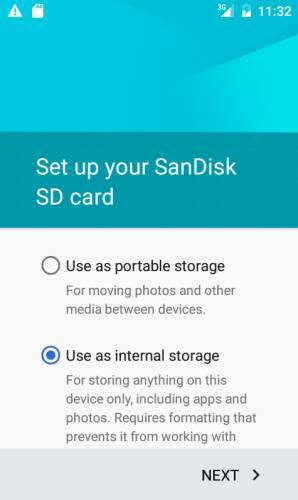 Android app developer StereoMatch did a little experimenting and discovered a few things about the way Android 6.0 lets you adopt external storage devices as internal storage that aren’t really all that clear from Google’s description. When Android 6.0 sees that you’ve inserted a microSD card the operating system will ask if you’d like to treat it as portable storage or as internal storage. If you choose portable storage, it’ll be treated the same way as removable storage devices have been for the past few versions of Android: you can’t easily install apps to the storage card, but some app data can be saved there and you can store music, movies, photos, and other content on the microSD card. Choose internal storage and the microSD card will be reformatted and encrypted. Once this is done, the card can only be used as internal storage. If you try to eject the card and read it on a computer, it won’t work. All data on the card will also be erased, so you may want to back up anything important first. Android does provide an option to migrate it, but early reports suggest it’s unreliable. Here’s why this matters: the built-in storage is almost certainly faster than any microSD card you’re using. You’ll see the biggest hit if you try to install apps to the removable storage card. But even with files and data loaded on the microSD card, your device might perform some tasks more slowly. This is good if you’ve got a cheap Android One handset or another device with just 4GB or 8GB of built-in storage, you might be willing to trade off a slight decrease in speed for a big boost in the amount of available storage space. Tell us in the comments what do you think?